As with FernGully, this was not a film I watched in my childhood, so the nostalgia goggles couldn’t help this 1993 film to win my affection. Nor was I at all impressed with this, the last hoorah of its studio’s animation department and its final animated feature film. A few years before Once Upon a Forest, Hanna-Barbera had been bought by TBS, owners of Cartoon Network, which at first did little more than rotate old Hanna-Barbera cartoons – which, much-maligned by animation historians as they may be for their cheap, limited animation, are iconic and adored by millions. After Once Upon a Forest, Hanna and Barbera took a big step back from involvement in their company and most of Hanna-Barbera’s staff worked on early Cartoon Network shows like The Powerpuff Girls and Dexter’s Laboratory. TBS merged with Time Warner soon after (too late to distribute this film, which went through Fox), and when William Barbera died in 2001, Hanna-Barbera essentially came to an end, the name returning only in association with Warner’s live-action and CG tie-ins with old cartoons. Cartoon Network Studios became an entity in its own right, and the animators who didn’t end up there largely went to Warner Bros. Animation. Joseph Barbera then passed in 2006. So in many significant ways, Once Upon a Forest was the pinnacle of what Hanna-Barbera created, and could even be called their swansong. But this rather important place in an important studio’s history does not make a film any good, and indeed, this is one I don’t like at all. I only saw it for the first time on 18.02.09, and my verdict was ‘babyish, badly-plotted and formulaic’. I apparently ‘despaired of relatively recent Western cel animation and its refusal to take risks’. Hanna-Barbera had become followers rather than innovators, if ever they could really be called such - and always too late. Their Gobots had its moments but was a poor man’s Transformers, and Pirates of Dark Water had all the scope and seriousness of an 80s cartoon – but came out in 1991 and was uglier than any of them. 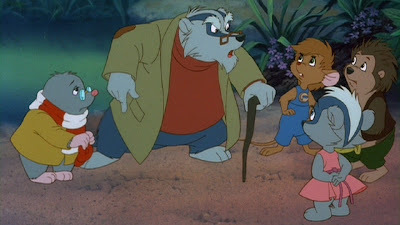 And while it probably does look better in fundamental animation terms than just about anything Hanna-Barbera ever churned out, it still looks like Secret of NiMH 2. Four young animals very much associated with woods apparently live in a forest – there is Russell the dumb hedgehog, Abigail the smug woodmouse, Edgar the brainy hedgehog and Michelle the baby badger. Michelle’s uncle Cornelius, played in a way that seems to really annoy a lot of people but in my view works acceptably well by Michael Crawford, takes the kids on a ramble, where they come across a road, which is of course a horrible dangerous place, made worse when someone chucks out a glass bottle to break on the road. When they get back to their homes, they find that glass bottle slashed the tire of a tanker carrying poison gas, which has killed everyone they know. Michelle breathes it in and falls seriously ill, so the other kids set off on a quest to find the herbs that can cure her. The ending is at least mildly bittersweet. The problem is that nothing in this film offers anything that could inspire strong emotions. It’s hard to care about the central kids. There’s no visual spectacle. Everything seems committee-written and committee-approved. The preachy environmental message is unlikely to inspire anyone to re-evaluate their behaviour and become environmentally aware. The best that can really be hoped for is that small kids will feel an irrational sense of guilt. A thoroughly mediocre film. The movie "once upon a forest is very fun.The characters are Michelle,Russell,Abigail,Edgar,and Cornelius.Michelle is a cute baby badger.Russell is a dumb hedgehog.Abigail is gea smug woodmouse.Edgar is a brainy hedgehog.